This post is the third in a series analysing the prospects for trade and foreign direct investment (FDI) diversification, with a particular focus on the UK and Canada in the age of Brexit. 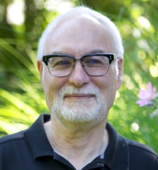 Daniel Shapiro, Saul Estrin, Christine Cote, Klaus Meyer, and Jing Li examine the nature of trade in services using ideas developed in the international business and economic geography literature to explore the interrelationships among multinational enterprises, global value chains and cities. Previous contributions (here and here) focused on trade in goods and services, concluding that distance still matters for trade in goods, but possibly less so for services, and that services, therefore, represent a more promising route to diversification. However, it has also been noted that trade in services is more complicated than trade in goods because the former typically involves movements of knowledge, people and capital. Trade in services is different because it involves a range of cross-border transaction including IT services, transportation services, tourism services, local offices providing banking, insurance, and communications services, and the short-run movement of service workers in these industries. At the same time, advances in digital technologies have served to expand the potential for trade and FDI in strategic business services including design, development and testing; education and training; sales and marketing; and R&D. The idea that developed economies like the UK and Canada should pursue diversification via trade in services is not new. For example, in a recent report, HSBC and Oxford Economics (HSBC, 2016) documented the potential for expanded trade in services. Nevertheless, as we discussed in a previous post, there are still doubts regarding the degree to which this is possible. In this post, we examine the nature of trade in services through a different lens. Using ideas developed in the international business and economic geography literatures, we explore the interrelationships among multinational enterprises (MNEs), global value chains (GVCs) and cities. We discuss in particular how global cities and MNEs are connected through changes in GVCs such that high value-added knowledge-based services and activities such as R&D, marketing and financial services tend to agglomerate in a relatively small number of global cities, and these cities, in turn, become both homes and hosts to MNEs. We focus on MNEs because it is well-known that the majority of global trade is orchestrated by MNEs, often through internal transfers of knowledge and services (Iammarino and McCann, 2013), and we focus on global cities because as we document below much of the international trade and investment in services originates in these cities. In essence, global cities help MNEs offset the costs of distance, particularly in knowledge-intensive activities, by providing location-specific advantages that match the firm-specific needs of MNEs. Our analysis centres on MNEs and global cities. However, we emphasize that many of the factors that make a city attractive to MNEs, also contribute to an entrepreneurial culture that facilitates the growth of smaller domestic knowledge-based companies. These entrepreneurial companies also extensively engage in cross-border activities, a process hastened by the diffusion of digital technologies (Autio et al, 2018). Image by kloniwotski, (CC BY-SA 2.0). Both world population and economic activity are increasingly concentrated in major cities and these cities represent important trade hubs (Berube and Parilla, 2012). However, the importance of cities relative to the size of national economies varies across countries. 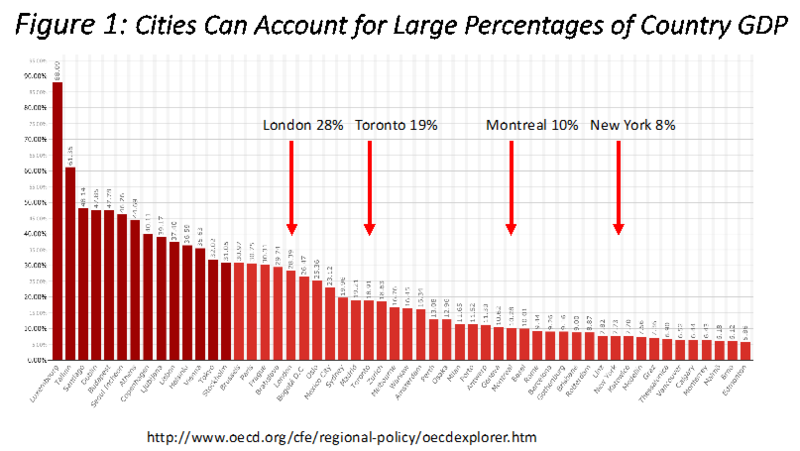 As indicated in Figure 1, London accounts for some 28% of UK GDP, while Toronto and Montreal together account for about the same percentage of Canadian GDP. In both countries, there a number of other cities that account for important percentages of population and GDP (see Figure 2) but a large percentage of GDP is concentrated in a relatively small number of cities. Perhaps not surprisingly, the largest cities attract significant amounts of FDI, most of it in services. For example, according to fDi Intelligence, a service of the Financial Times that collects data on greenfield FDI, from 2012-2017 London attracted far more foreign investments than any other EU city and the same number as the next three largest (Paris, Dublin, Berlin). The vast majority of these investments (over 80%) were in services, including software and IT services, business services and financial services. Similarly, New York was the primary recipient of projects in the Americas, but Toronto was ranked fourth. Similar to London, Toronto attracted the majority of FDI to Canada (about one-third), and over 70% of those investments were in services. It is also worth noting that Montreal increased its share of Canadian FDI from 6% to 13% over this period, largely because of an increase in investments from France, perhaps the result of the Canada-France Joint Action Plan for 2012-2013. MNEs are the vehicles through which much of this trade and investment occurs. While it is difficult to isolate services, in its World Investment Report 2013, the United Nations Conference on Trade and Development (UNCTAD 2013) estimated that some 80% of international trade was being organized by lead MNEs investing in cross-border production and, then, trading with suppliers and customers worldwide. Thus trade and FDI are linked (Hoeckman, 2014). The World Bank (2017) suggests that some 30% (60%) of US exports (imports) occur through intra-firm trade. Moreover, a third of the world’s largest corporations are concentrated in only 20 major cities (McKinsey Global Institute, 2013), and this is expected to increase (KPMG, 2015). Our own calculations indicate that as of 2018, nearly half of the Fortune 500 largest companies were located in just 20 cities, including London, UK (14 headquarters, ranked 5th) and Toronto (7, ranked 9th). A feature of the global economy is the unbundling of activities along the global value chain (GVC) such that different activities are performed in different locations and traded internationally (Gereffi and Fernandez-Stark, 2016; Fu, 2018; Timmer et al, 2014). Thus countries, and in the case of services and intangible goods, cities, tend to specialize in some specific segment of the GVC. 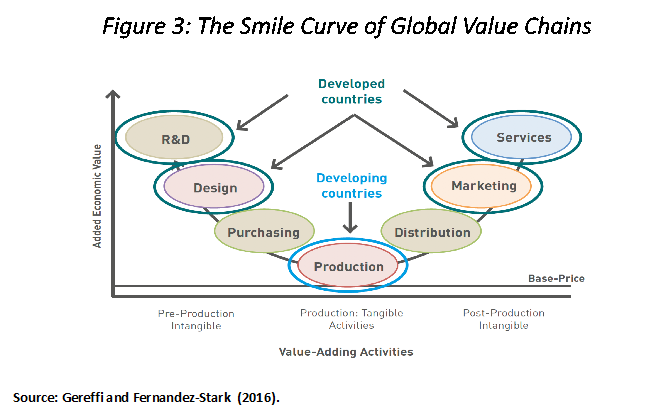 The nature of the division of activities across countries is often summarized in the “Smile Curve” (Figure 3), which suggests that higher value-added activities associated with R&D, design and business support services tend to be located in developed countries, and as suggested above, in cities. Importantly, these investments are often undertaken by firms that are not in the service industries. One estimate suggests that in 2011, 35% of foreign investment projects by large MNEs (including those not in service industries) were in support services, including marketing and sales, design, and R&D (Belderbos et al, 2016, Figure 3), up from 25% in 2003. 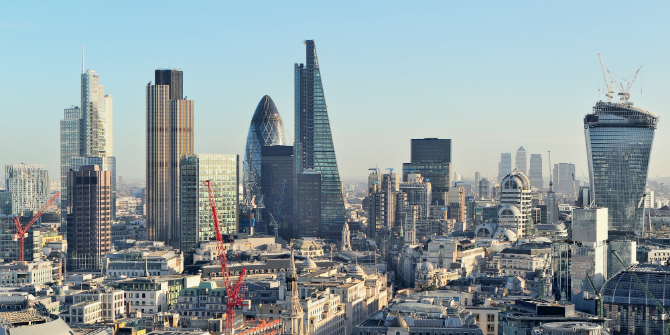 These investments include units with coordination functions such as divisional or regional headquarters (HQ), or holding companies – a type of subsidiary historically particularly attracted to London, UK because of its springboard position to European markets. The link between the location of higher value-added activities and cities occurs because cities can minimize the spatial transaction costs related to trade in knowledge-based services (Cano-Kollmann et al., 2016). For example, large cities provide access to a wide variety of complementary services, larger pools of specialized labour, and a sophisticated transportation and communications infrastructure. Thus, one observes the emergence of interconnected global cities as providers of advanced knowledge-based services for the global economy (Sassen, 1991; 2012; Taylor and Derudder, 2016). Indeed, one prominent approach to measuring global cities (Beaverstock, et al, 1999) builds on Sassen to use data on the presence of advanced producer services (service MNEs in advertising, law, accounting, finance, insurance) as the basis for ranking cities. Another, and more recent version of the ranking is illustrated in Figure 4 (Taylor et al, 2009). This method allows cities to be ranked according to both the presence of service MNEs and the degree to which city pairs share the same set of firms. 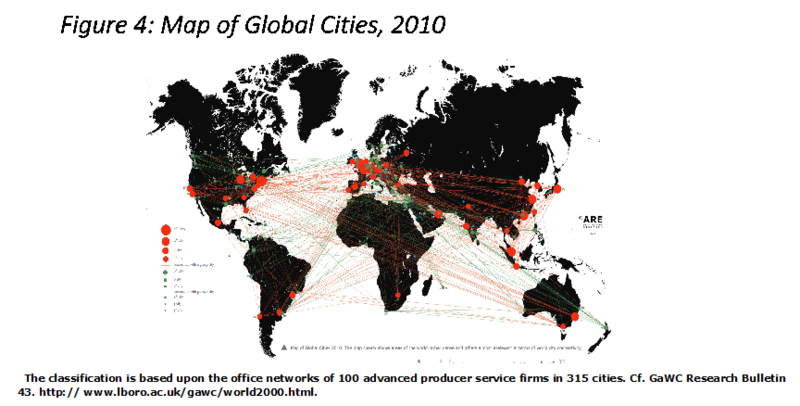 Global cities are therefore understood as key nodes in global knowledge and trade networks. In the example provided in Figure 4, 100 service providers are measured in 315 cities, which are then ranked and grouped into categories. The most global cities attract the greatest number of advanced service providers and are most connected to other such cities. It should be noted that alternative measures are available, for example AT Kearney’s list of Global Cities which uses an expanded set of criteria to rank cities. However, for our purposes, it is sufficient to note that both rank London and Toronto among the top 20 global cities, and this would be the case for most definitions. However, the definition of a global city varies from study to study, as will the number of ranked cities. One important consequence of the unbundling of GVCs, is that R&D and other innovative activities associated with MNEs are increasingly dispersed around the world. However, the decisions regarding the location of these activities is frequently city, not country, based. For example, Samsung’s semiconductor business unit has R&D centres in 11 cities around the world. In a comprehensive analysis of the fDi data discussed above, Belderbos et al (2016) conclude that some 40% of inbound global cross-border R&D projects are directed towards 57 global cities (including London, Edinburgh, Toronto, Montreal and Vancouver), and 40% is accounted for by large MNEs. Importantly, the 57 global cities also account for about 40% of outbound R&D projects. Global cities are therefore both primary homes and hosts to knowledge-based investments in R&D and design, as well as other advanced business services. This suggests that cities should not be viewed only as providers of advanced business services, but also as critical elements in the creation and global diffusion of knowledge and that MNEs act as orchestrators and connectors of spatially dispersed knowledge sources (Cano-Kollmann et al. 2016). Indeed, in the international business literature, the MNE is conceived as a global creator, organizer, and connector of knowledge networks across locations, rather than a simple vehicle for technology transfer between given locations (Beugelsdijk and Mudambi, 2013; Cantwell, 2017). Innovative and knowledge-based activities are therefore understood as a combination of firm- and location-specific advantages. Thus “the two processes of innovation and internationalization have become ever more interconnected as central drivers of development” (Cantwell, 2017: 41). In essence, the increased importance of knowledge-based activities to the MNE and the global sourcing of knowledge accompanying the emergence of global value chains have “linked localized innovation systems to international business and to international knowledge exchange” (Cantwell, 2017: 42). In other words, one function of the MNE is to exchange knowledge across locations. The “localized innovation” referred suggests a sub-national location, which may be a global city, however defined, or it may be a specialized knowledge cluster within a global city, or it may be a city-region (a region anchored by a global city such as the “golden horseshoe” in the Toronto area). The point is, however, that global cities both attract and create knowledge. As a corollary, recent literature has focused on the role of cities as facilitators of entrepreneurship and new firm creation (Audretsch, Belitski & Desai, 2015; 2018), including those that are “born global” MNEs (Knight & Liesch, 2016). Many of these are likely to be based on digital platforms or knowledge platforms that result in firms selling services or locating abroad at an early stage (Autio et al, 2018). Thus, global cities both attract MNEs and facilitate their creation. Thus, we conclude that global cities reduce spatial transaction costs, which reduces the costs of distance, and favours them as locations for advanced knowledge-based services, including innovative activity. In consequence, knowledge-based services tend to be concentrated in global cities, and to some degree define them. Together they form networks of cities among which these services are traded. At the same time, global cities both attract firms that trade and invest in services, but also create the conditions for the emergence of new global firms. Many of these are likely to be based on digital platforms that result in firms selling services abroad at an early stage (Autio et al, 2018). Although the importance of cities has been studied by economic geographers, it has until recently been less prominent in the international business (IB) literature which viewed “location” from a country perspective (see Iammarino, McCann, Ortega-Argilés, 2018 for a survey). However, this has changed over the last few years, with an increasing recognition by scholars of the role of cities as essential components of the process of knowledge creation and diffusion across borders (Cano-Kollmann, Cantwell, Hannigan, Mudambi, & Song, 2016; Santangelo, 2018; Mudambi, Narula & Santangelo, 2018). A number of empirical studies confirm that global cities are preferred locations for MNEs (Goerzen, Asmussen, and Nielsen 2013; Blevens et al, 2016; Belderbos, Du & Goerzen, 2017; Asmussen et al, 2018), and that peripheral cities are preferred locations if they are proximate to a global city (McDonald et al, 2018). For example, Goerzen et al (2013) argue that global cities reduce the costs of distance, often referred to as the liability of foreignness because they agglomerate advanced service providers, facilitate knowledge flows within and between MNEs, and provide cosmopolitan environments that welcome the foreign presence. Moreover, as emphasized by Belderbos and his collaborators (2016), R&D is an important part of the smile curve, and MNEs have begun to both internationalize their R&D activities, and to co-locate with other MNEs in specific city locations. Thus global cities provide strong incentives for MNEs to locate in them, and these same incentive encourage co-location and co-evolution of firm and location. Global cities are also preferred locations for HQ functions. For example, Belderbos et al (2017) find that connected global cities are favoured as locations for regional HQs. Asmussen et al (2018) continue this theme and find that global cities provide locational advantages for regional headquarters, which in turn serve as a “beachhead” investment. They provide as an example, the case of Schneider Electric SA, the French energy management and engineering MNE with operations in more than 100 countries. Schneider’s main subsidiary in Denmark is Schneider Nordic Baltic A/S, located in central Copenhagen, listed by AT Kearney as a global city. However, Schneider Nordic Baltic A/S, owns other firms in Denmark, and thus operates as a regional investment platform from its base in Copenhagen. MNEs also prefer to locate R&D and design activities in global cities, as shown for example by Castellani and Lavoratori (2017). At the cluster level, Li & Bathelt (2018) find that knowledge intensive firms are more likely to locate in clusters, both at home and abroad. Thus, MNEs leverage local knowledge pools by strategically locating affiliates across clusters. In addition, there is evidence that internationally connected innovation clusters have performance advantages, supporting the idea that firms and locations co-evolve (Turkina & Van Assche, 2018). In sum, there is accumulating evidence that globally connected cities and clusters reduce the costs of distance, and thereby attract investment by MNEs. At the same time, these investments link the host location to a global network of knowledge-based locations. Thus, we observe the co-evolution of firms and locations, and an increase in international knowledge-based transactions. We conclude that the most promising prospects for international diversification that overcomes the costs of distance is in knowledge-based activities and services, and that the location of these services is concentrated in subnational entities, mainly global cities of various kinds. Global cities serve as both innovation and service hubs, with connections among them linked to the activities of MNEs. However, it is not clear whether or how public policy, notably with respect to trade, can effectively recognize the importance of this network of global cities, and become more “place sensitive” (Iammarino et al, 2018). Domestic policies that foster innovation and clusters in cities are a critical component of an international diversification strategy, because these investments can attract FDI and promote trade in knowledge-based services, and can facilitate the creation of home-grown MNEs. They should, therefore, be understood as the provision of trade-related infrastructure. These policies should incorporate the specific nature of “global” cities, and the different roles each can play. In other words, we propose that domestic policies that strengthen global cities, global clusters or global city regions should be understood as part of a trade diversification strategy. Such policies should consider not only place (where the activity occurs), but space (how it is connected). Global cities benefit from the strength of their economic clusters. Policies that strengthen clusters not only strengthen the global city but also help spread the benefits to the periphery of global cities as knowledge spills over. Public policy should, therefore, support investments in the infrastructure that connects global cities with their peripheral areas. Due to the different geographies of Canada and the UK the implications of this argument may vary in terms of the number of hubs considered. Global cities should be represented in international trade negotiations to be able to make their interests heard, and to identify trade development opportunities. This applies in particular with respect to provisions regarding services. The question is whether this can be accomplished within current trade negotiation frameworks or whether it implies the creation of new cooperative and deliberative mechanisms (Hoeckman, 2014; (Stephenson, 2016), which include cities in their design. 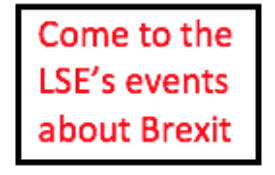 Saul Estrin is Professor of Management at the London School of Economics. 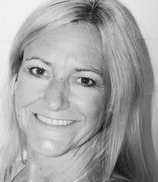 Christine Cote is Senior Lecturer in Practice at the Department of Management (LSE). 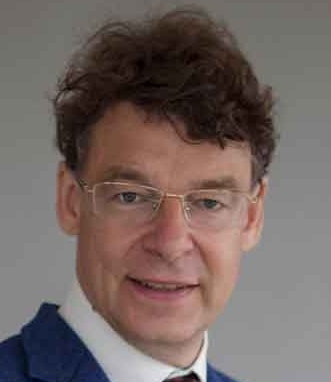 Klaus E. Meyer is Professor of International Business at Ivey Business School. Jing Li is Associate Professor of International Business at Beedie School of Business. Audretsch, D. B., Belitski, M., & Desai, S. (2015). Entrepreneurship and economic development in cities. The Annals of Regional Science, 55(1), 33-60. Audretsch, D. B., Belitski, M., & Desai, S. (2018). National Business Regulations and City Entrepreneurship in Europe: A Multilevel Nested Analysis. Entrepreneurship Theory and Practice, 1042258718774916. Autio, E., Szerb, L., Komlósi, E. and Tiszberger, M. (2018), The European Index of Digital Entrepreneurship Systems, EUR 29309 EN, Publications Office of the European Union, Luxembourg. Beaverstock, J. V., Smith, R. G., & Taylor, P. J. (1999). A roster of world cities. Cities, 16(6), 445-458. Belderbos, R., Du, H.S. & Goerzen, (2017), “Global cities, connectivity, and the location choice of MNC regional headquarters”, Journal of Management Studies, 54, 8, 1271-1302. Belderbos, R., Sleuwaegen, L., Somers, D., & De Backer, K. (2016). Where to Locate Innovative Activities in Global Value Chains: Does Co-location Matter? (OECD Science, Technology and Industry Policy Papers; No. 30). Paris: OECD Publishing. Beugelsdijk, S. and Mudambi, R. (2013). MNEs as border crossing multi-location enterprises: the role of discontinuities in geographic space. Journal of International Business Studies, 44, pp. 413–426. Blevins, D. P., Moschieri, C., Pinkham, B. C., & Ragozzino, R. (2016). Institutional changes within the European Union: How global cities and regional integration affect MNE entry decisions. Journal of World Business, 51, 319–330. Cano-Kollmann, M., J. A. Cantwell, T. J. Hannigan, R. Mudambi, and J. Song. (2016). “Knowledge Connectivity: An Agenda for Innovation Research in International Business.” Journal of International Business Studies 47 (3): 255–262. Cantwell, J., (2017) Innovation and international business, Industry and Innovation, 24:1, 41-60. Castellani, D. & K. Lavoratori, 2017. “Location of R&D abroad. An analysis on Global Cities,” John H Dunning Centre for International Business Discussion Papers 2017-03, Henley Business School, Reading University. Gereffi, Gary and Fernandez-Stark, Karina (2016). Global Value Chain Analysis: A Primer, 2nd Edition. Durham, NC: Duke Center on Globalization, Governance & Competitiveness. Goerzen, A., Asmussen, C. G., & Nielsen, B. B. (2013). Global cities and multinational enterprise location strategy. Journal of international business studies, 44(5), 427-450. Iammarino, S., and McCann, P., 2013, Multinationals and Economic Geography: Location, Technology and Innovation, Edward Elgar, Cheltenham. Knight, G.A. &. Liesch, P. (2016). Internationalization: From incremental to born global, Journal of World Business, Volume 51, Issue 1, Pages 93-102. KPMG (2015). Global Cities Investment Monitor 2015: New Ranking, Trends and Criteria. New York: KPMG. Fu, X. (2018) ‘Trade in Intangibles and A Global Value Chain-based View of International Trade and Global Imbalance’, University of Oxford, TMCD Working Paper Series, No. 078. McDonald C, Buckley PJ, Voss H, Cross AR, Chen L. 2018. Place, space, and foreign direct investment into peripheral cities. International Business Review. Elsevier 27(4): 803–813. McKinsey Global Institute (2013). Urban World: The Shifting Global Business Landscape. New York: McKinsey Global Institute. Mudambi, R., Narula, R. and Santangelo, G.D. (2018), “Location, collocation and innovation by multinational enterprises: a research agenda”, Industry & Innovation, Vol. 25 No. 3, pp. 229-241. Santangelo, G.D. (2018) Multinational enterprises and global cities: a contribution to set the research agenda. Competitiveness Review: An International Business Journal, 28, 3, 230-235. Sassen, S. (2012) Cities in a World Economy. Thousand Oaks, CA: Pine Forge Press. Stephenson, Sherry. 2016. Trade Governance Frameworks in a World of Global Value Chains: Policy Options. E15 Expert Group on Global Value Chains. Geneva: International Centre for Trade and Sustainable Development (ICTSD) and World Economic Forum. Taylor, P. J., Derudder, B. (2016), World City Network: A global urban analysis, 2nd Edition, Routledge, London. Timmer, Marcel P., Abdul Azeez Erumban, Bart Los, Robert Stehrer, and Gaaitzen J. de Vries. 2014. “Slicing Up Global Value Chains.” Journal of Economic Perspectives, 28 (2): 99-118. Turkina, E. & Van Assche, A. 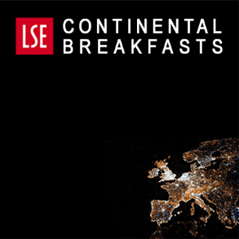 (2018), Global Connectedness and Local Innovation in Industrial Clusters. Journal of International Business Studies, Vol. 49, Issue 6. World Bank Group. 2017. Global Economic Prospects, June 2017: A Fragile Recovery. Washington, DC: World Bank. © World Bank. https://openknowledge.worldbank.org/handle/10986/26800 License: CC BY 3.0 IGO.